Mature Dating uk.com: Looking for love later in life? This is the perfect place to start. Whether you just want companionship or are looking for a new life partner this dating site is suitable. 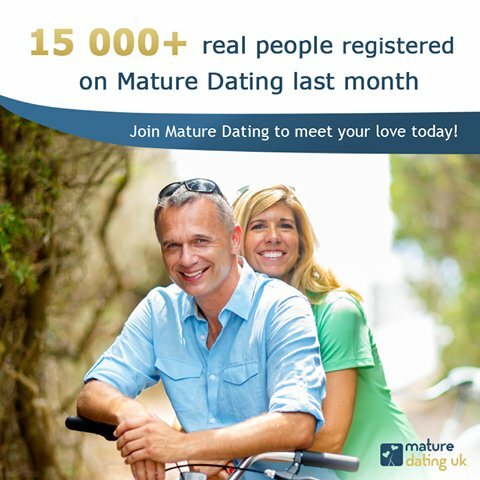 Mature Dating uk.com is the perfect place for mature singles into online dating, fun and marriage’. It’s one of the best senior dating sites that we’ve come across, featuring thousands of profiles, great features and attractive prices too. It’s pipped to the post because it doesn’t quite compete with the top choice in terms of membership base or range of features, but is still a wise choice for the discerning dater. As the name suggests, it caters for British mature daters; however, if you’re resident in another country there are plenty of other sites in this category to check out. If you live abroad and want to move to the UK or are looking for someone with that British twang, this site might also be of use to you. It’s free to join MatureDatingUK.com and all you need to complete your registration is a valid email address. Although you were previously required to fully complete your profile in the past, this site now lets you skip all the long questions and get browsing immediately after you’ve verified your email address. Profiles are detailed, with basic information, physical attributes, personality traits, lifestyle preferences and a self-written section. The majority have at least one photo, which suggests that members are enthusiastic and serious about putting effort into their profiles. Profiles on the site generally are very well designed and set out, making it a pleasure to use. It’s possible to upload up to 10 photos and there’s plenty of guidance and stipulation on how to go about composing and uploading your pictures. As a result, the standard of images is very high. Unfortunately, as a standard member you’re unable to see full size photos, so you’ll have to upgrade in order to do so. From a member’s profile it’s possible to get communicating in a range of ways. Email is the standard method of communication but it’s also possible to ‘wink’ at members you haven’t met or send an ‘icebreaker’ (a wink is an automated preformatted icebreaker sent at the click of a mouse button, whilst icebreakers are much the same but allow you to select your own corny opening line – best to stick to the winks). You can also send requests to chat in real time using IM messenger and video chat features, which allow you to get to know people that little bit better than email. If you add somebody to your favorites list they will be informed and will most likely at least check out your profile. In addition, you can send friend requests and build your own friends network. Live chat rooms enable you to meet lots of members in one place (though the chat rooms were pretty quiet when we checked) or you can configure your own (e.g. to chat just with people in your friends network). You might also consider a ‘date cast’, which is a feature that allows you to bulk email everybody in your search returns. If it weren’t quite expensive, it would be a good idea to purchase the 3-day trial first so you can try out all the features with minimal commitment. That considered, it’s best to spend £10 for three days than £60 for 6 months if you quickly decide you don’t enjoy using the site. For further help and guidance there’s a useful FAQs page on the site along with email support and a credit card payment hotline should you wish to subscribe by phone.